"The Sword of the Dales, an icon of the Dalelands symbolizing the unity and strength of the people, has reappeared! Created by Shraevyn the weapon-mage hundreds of years ago, the lost Sword had become nothing more than a fantastic children's tale - until now. A group of warriors led by Randal Morn, rightful ruler of Daggerdale, rushed to the Sword's resting place to recover it, but dark forces awaited them, and Randal and his men fell to an ambush. Only one man escaped, yet he brought with him the hope that Randal Morn yet lives. Resolved to rescue his leader, that lone survivor turned to the great Elminster of Shadowdale for aid. This is the first of three adventures that grant player characters to oppurtunity to determine the fate of Daggerdale. The saga continues with The Secret of Spiderhaunt and concludes with The Return of Randal Morn." "The infamous Sword of the Dales has always held a certain fascination in the eyes and hearts of the citizens of the Dalelands. Thus, it was no surprise when Randal Morn, rebel leader of Daggerdale, led an expedition into the crypt of a long-dead wizard to recover the weapon. Shraevyn the weapons-mage had created the Sword long ago, and it stood to reason that the blade would be waiting within his tomb. Perhaps the Sword of the Dales would allow Randal Morn to rule Daggerdale once again. But Randal Morn never returned from that fated party. Only tales of terror told by a lone survivor held any clues as to Randal's fate. A brave band of heroes accomplished what Randal Morn's group failed to do in part one of this trilogy, The Sword of the Dales. 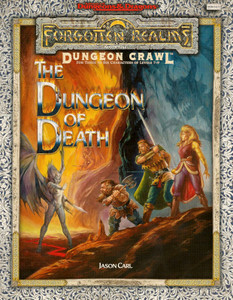 Battling through the tomb's undead inhabitants, those heroes reached the burial crypt of Shraevyn. There, resting in the center of the coffin, was the Sword of the Dales, its azure glow filling the chamber. However, there was no sign of Randal Morn. Only a note signed by his hand held any clue as to his fate. "Seek me in Spiderhaunt," it proclaimed. "The fate of Daggerdale is in your hands." 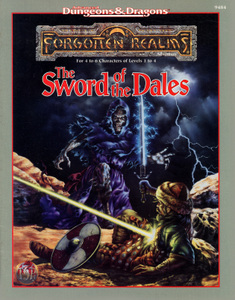 This is the second part of a trilogy of modules that began with The Sword of the Dales. The saga concludes with The Return of Randal Morn." "In part one of the Randal Morn trilogy, Sword of the Dales, the legendary leader of Daggerdale, Randal Morn, was captured by unknown assailants as he sought to regain the great weapon for which the adventure was named. A stalwart band of young and enthusiastic heroes was recruited to ride to his aid, yet all they recovered was the Sword itself and a message: "Seek me in Spiderhaunt Wood." 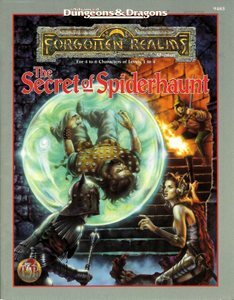 In the second part of the trilogy, The Secret of Spiderhaunt, those same adventurers found Randal and freed him briefly, yet he was almost as quickly torn from their grasp by an agent of the evil Zhentarim, seeking to end the threat of Randal Morn's return to power. 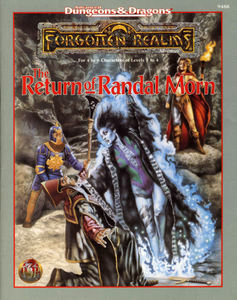 In this final episode, the heroes must follow the kidnapper's trail and rescue Randal Morn before the Zhentarim finish interrogating him and the axe falls upon his neck. Armed with the Sword of the Dales and aided by a powerful magical spirit that lives within the weapon, the heroes much march into the heart of Zhent-occupied Dagger Falls, free Randal Morn, and save the city from utter destruction. The job is dangerous - perhaps more than the heroes can handle - yet those who would live in songs and legends cannot concern themselves with living to a ripe old age!" "Hellgate Keep - a name that once made the boldest of heroes shudder in fear - was long ago known as the fair citadel of Ascalhorn, a haven for elves and humans. Then a demonic horde of baatezu and tanar'ri destroyed all remnants of real civilization and turned it into a den of malevolence. Today, the citadel lies ruined. The Mistmaster and the Harpers destroyed the keep and ended its centuries-long reign of evil in the autumn of the Year of the Gauntlet (1369 DR)...or so they believed. With the coming of the following spring, many scavengers streamed to the Upvale to uncover treasures and artifacts long hidden by the tanar'ri of Hellgate Keep. They went forth assuming they could find easy plunder. They were wrong. Prepare to meet a new race of creatures spawned both of Faerûn and the Lower Planes. Uncover the corruption of an elven house that was ancient before Myth Drannor ever rose. Find out what survived the havoc visited upon the Keep, and who or what leads the survivors to a new lair. All this and more awaits amid the depths of ruined Hellgate Keep! This stand-alone 32-page adventure is set within the northern wilderness of the Realms. 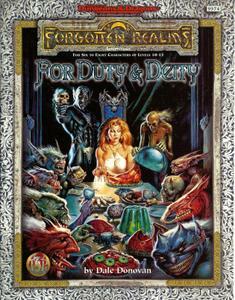 It easily fits within an existing FORGOTTEN REALMS campaign, though it can also be incorporated into any other AD&D campaign world with minor modifications." "Cryptic rumors spread across the far North, sparking new interest in a shadow-haunted ruin. Although it was once a seat of ancient dwarven power, centuries of unspeakable evil have transformed this former gem mine into the demon-infested, trap-filled Dungeon of Death. Its name is well deserved - unwary visitors fall victim either to the ravenous fiends that reside within the dungeon or to the insidious Shadow Curse that pervades the place. Inside lies a grueling challenge of skill and courage that only the bravest and most experienced heroes will survive. This stand-alone adventure is set within one of the most infamous dungeons of the Realms. It easily fits within an existing FORGOTTEN REALMS campaign, and it can also be incorporated into any other AD&D campaign world with minor modifications." "The kingdom of Cormyr is a land of law and order, a country populated by citizens who live good lives and treat their neighbors well. If you think these characteristics make Cormyr an unexciting and uninviting place... think again. Despite the ever-present Purple Dragon soldiers and War Wizards who are charged with keeping the kingdom safe from treachery and greed, Cormyr is a place where evil lurks in countless nooks and crannies, where opportunites for heroic adventurers to do good for themselves and for all of Cormyr are as abundant as the dents on a dwarf's helmet. 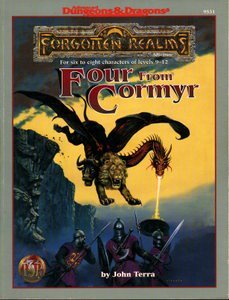 Four from Cormyr is a quartet of adventures that can be played individually or as a series. By the time they have experienced all that lies within this 128-page book, ranging from a grand soiree at the home of a noble to a chilling expedition into the Vast Swamp, player characters will know more about this challenging land than they ever thought they would need to know - and even if they succeed in countering all the threats they will face, they'll find that the conclusion to each adventure opens a new vista of possibilities for continuing danger and intrigue. Suitable for six to eight characters of levels 9-12"
"An ominous encounter with a fortuneteller sends a party of adventurers on a 200-mile journey across the Lands of Intrigue. While traveling through the townns and terrain (detailed here for the first time) that lie in their path, they hear rumors and obtain clues about their mission. Their ultimate destination is Castle Spulzeer, a once proud stronghold that has become a den of terror. 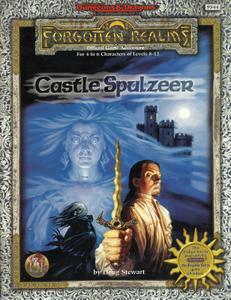 Castle Spulzeer is an adventure complete in itself. However, as a crossover story, it offers every Dungeon Master a choice between two endings. The first leaves the part in the Realms. The second transports the characters to the Demiplane of Dread where the plot continues in the RAVENLOFT adventure The Forgotten Terror." "For over a decade, mystery has surrounded the fate of the lost goddess of trade and wealth, Waukeen. The Golden Lady disappeared during the Time of Trouble and has not been heard from since. Now, in Marpenoth in the Year of the Tankard (1370 DR), a young prophet suffers from disturbing, divine visions that reveal a beautiful, golden-tressed woman imprisoned on a far plane of existence by some great evil. 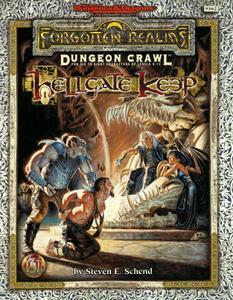 This stand-alone adventure was developed in concert with the PLANESCAPE adventure anthology Tales from the Infinite Staircase. They can be played seperately. However, guidelines within both allow a Dungeon Master to use either product as a subplot for the other, creating new opportunities for player characters and extending the opportunity for adventure." "Ruthless kidnappers have abducted the eight-year-old son of Reverend Judge Hykros Allumen, Ravens Bluff's reigning high priest of Tyr. You have been entrusted with the task of delivering the ransom - 500,000 gp worth of platinum, magic, and jewels. Can you see it safely past all the greedy bandits trying to intercept you and take the treasure for themselves? And if you do, can you trust the kidnappers to return the stolen child? A tale of trust, betrayal, and revenge. 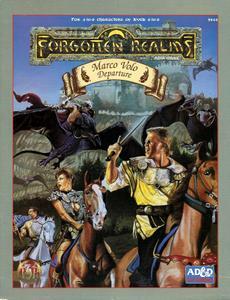 This classic tournament has been revised for use with the new City of Ravens Bluff sourcebook. It is adaptable for use in any low-level, mid-level, or high-level campaign." "Icewind Dale, Ten-Towns, Regis the lovable halfling scoundrel, and Drizzt Do'Urden, drow ranger. These names are legendary in the annals of the FORGOTTEN REALMS setting, made famous in the best-selling novels by author R.A. Salvatore. Now, Salvatore and his original gaming group, the Seven Swords, return to the Savage Frontier in this exciting 32-page adventure. The PCs begin in the port city of Luskan, where they're hired on by a caravaning merchant to perform guard duty for the long, dangerous journey over the Spine of the World Mountains. If the heroes do well, they reach the small town of Targos, where they hear rumors of a dead mage's lost tower out on the tundra. 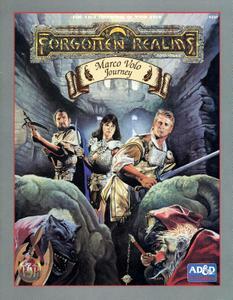 In order to find it, the PCs must overcome numerous obstacles but may find allies in the peoples of the Ten-Towns region, including a barbarian prince, a sly halflig, and a unique ranger. Not all is as it seems, though, nor can all smiling faces be trusted. 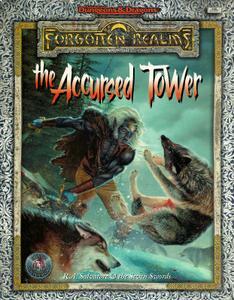 Can the PCs seperate the truth from the lies, locate the Accursed Tower, determine all its secrets, and survive?" "The Wyrmskull Throne - the ruling seat of the great dwarven nation of Shanatar - has been lost for five millennia. Now, rumors have surfaced that it has been found, and there are sinister parties that will stop at nothing to claim it. But the path to finding the throne is long and twisted, leading from a small vilalge in the remotest regions of Tethyr to the bottom of the ocean! Those who follow it had best be prepared for the strange and wondrous - as well as enemies on every side - for it is no journey for the faint of heart. 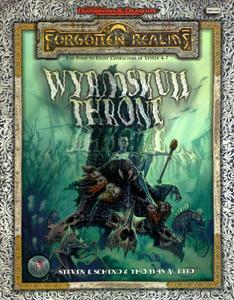 The Wyrmskull Throne is a companion adventure for the FORGOTTEN REALMS accessory Sea of Fallen Stars. It can be played as a stand-alone adventure or with the material presented in that volume." "Marco Volo: Depature is the first volume of the Marco Volo trilogy, designed for four to eight player characters of levels 6 to 8. This free-wheeling adventure begins with an intrigue-laden journey from Waterdeep to Shadowdale. The party is thrown into the company of one Marcus Wands (also known as "Marco Volo"), a bothersome but likeable little rogue. 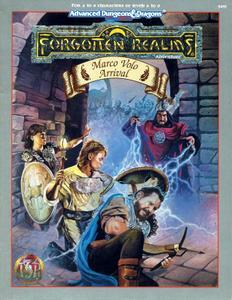 In his guise of Marco, he gains unintentional help from the party members, leading only to their own arrests. To remedy that predicament, the characters are strong-armed into carrying an important letter to Shadowdale, and taking along Marcus as their "guide." Of course, things are nowhere near as simple as they seem. There's this little matter of the Dragonking's Eye, a powerful artifact from another plane. Naively, Marcus thought he could steal the thing and pin the theft on Volothamp Geddarm, the rougish author of many popular books about cities in the Realms. The notorious mage-assassin Felibarr Blacklance has been hired to hunt for the thief, and he is a man grimly determined to earn his fee. Then there's the business about this letter that's on its way to Shadowdale. It is accompanied by a rare enchanted item that wizards and fortune hunters want to obtain at all costs. A series of adventures ensues that takes the adventurers from Waterdeep to the Way Inn, by which time they will doubtless suspect there is more to Marco Volo than meets the eye. Amid the brawls and mistaken identities, the wild rides and the glowering villains, the characters never have a chance to slow down or catch their collective breath. What results is a light-hearted, picaresque adventure in the manner of Dumas and Sabatini, and a good time is had by all! (Except by the bad guys, of course. They're never happy with how things are turning out...)"
"Marco Volo - Journey is the second volume of the Marco Volo trilogy, designed for four to eight player characters of 6th-8th level. 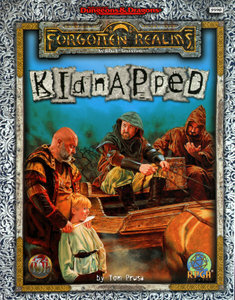 This free-wheeling adventure began in Waterdeep as the characters set out on an intrigue-laden journey to Shadowdale. Accompanying them is Marcus Wands (known as "Marco Volo"), a bothersome but likeable rogue. After leaving the Way Inn, the party heads for the Chauntean Monastery near Berdusk, where they have been promised safe shelter. Arriving at the monastery, all seems pastoral and pleasant... but of course, things are never quite that simple. After escaping from the monastery, the PCs run afoul of King Azoun's Purple Dragons on the lookout for the infamous thief, Marco Volo. Only the timely intervention of a band of wandering entertainers enables the party to continue on its way. While on the road with Heino's Woodland Troupe, the characters learn the joys of being in a traveling repertory company, performing for a different audience each night. In the course of the adventure, the PCs also learn more about Marcus and his secrets - some of his secrets, anyway. There's still the matter of the mysterious letter, and that powerful artifact from another plane, the Dragonking's Eye. The adventure ends with Shadowdale in sight not to be reached, however, without a final confrontation with the notorious mage-assassin Felibarr Blacklance. This volume of the Marco Volo trilogy offers DMs the oppurtunity to run unusual encounters, and it calls for considerable role playing from all. Player characters cannot easily rely on their swords and spells to get them out of the brawls and misunderstandings that arise. What results is a dramatic but picaresque enterprise as the adventure continues!" "Marco Volo - Arrival is the third and last volume of the Marco Volo trilogy, designed for four to eight player characters of 6th-8th level. When the characters first set off on an intrigue-laden journey to Shadowdale, they did not suspect how much trouble they would get into. Joined by Marcus Wands (also known as "Marco Volo"), they found him just a bothersome but likeable little rogue. No one suspected he was on the run from the crazy wizard Sabbar. The troublesome Marcus had previously stolen from him a rare artifact called the Dragonking's Eye, and hid it in the Spiderhaunt Woods. Now the party approaches the Spiderhaunts, and Marcus insists on diverting the group to retrieve the Eye. But strange things have been happening there. There are rumors: of an oddly constructed keep of bone (or is it crystal? ); of a warlord out for conquest (or is it a lich? ); of goblin tribes strangely clad, and extra-planar beings banding with the giant spiders of the aptly named Spiderhaunt Woods. Something evil has denned at the heart of the forest. It has a mind of its own....and it has plans for Faerûn. The last volume of the Marco Volo trilogy gives a DM the tools to run this free-wheeling, fast-paced adventure, and the secrets of the powers at work behind the scenes. The player characters must face - and deal with - the mad wizard Sabbar, the annoyed Volothamp Geddarm (who wants to have "a little chat" with Marcus! ), and ultimately the Dragonking's Eye itself. Even the gods themselves step in to have their say. In a dramatic denouement, this epic adventure draws to a close, but the memory of what transpired will live on!"